Instructions for hanging curtain rods are included. White finish, includes two end brackets and one support bracket. Projection, 2 3/4 to 4 1/4 inches. Clearance 2 to 3 1/2 inches. A rod to be used with heavy fabrics. A commitment to quality. Window drapery rods by Graber. Graber super heavy duty features include a universal front loading end bracket, metal adjustable and reversible master carriers ball bearing end pulleys, a spring loaded side gate for adding or removing slides, molded, canted slides, can be converted to one way draw, scored center support base for easy mounting on narrow casings, universal cam lock stirrup, braided polyester cord, and angled tip on overlap arm. Sheerweave 5000 Transparent is available in the widths below from 18" up to 96" with Rollease clutch system or Somfy LT30 12 volt battery powered, radio controlled system. Telis transmitters are optional in one to sixteen channel models for controlling your shade. Multiple shades can be controlled with multiple channel transmitters. 12 volt battery wand is included with the motor. Four finishes, bright brass, antique brass, black and brushed nickel. Adjusts from 48 inches to 84 inches in width. Projects 3 1/2 to 4 1/2 inches, clearance 2 1/2 to 3 1/2 inches. 1 1/2 inch diameter Windsor curtain rod. drapery hardware collection by Graber. Rods are metal, slides and finials are plastic. Select color from drop down box. 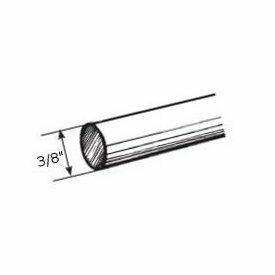 1-541: Decorative traverse rods 28-48" two-way draw projects 3 1/2 to 4 1/2"
Use this spring tension curtain rod with your sidelight curtains if the window is recessed. Also use for any window that is recessed for a no holes installation. Brass finished and adjustable, by Kirsch. Single standard curtain rods 84-120"
White finish. 2 1/2" projection, open back. by Graber. 4-421-1: Single standard curtain rods 18-28"
4-422-1: Single standard curtain rods 28-48"
4-423-1: Single standard curtain rods 48-84"
Two way draw, includes 2 support brackets and 38 slides for attaching your curtains. Curtain rod hardware for the budget minded. Empire Traverse Rods are made from heavy guage steel with a baked enamel finish. Quick mounting drop in brackets and supports that fit over rod are included. Cord guide is included to hold cord to wall. The Empire rod has self lubricating pulleys and slides. Polyester cor and continuous lacing for use at either end or to convert to one way draw. Brass finish with spring clip . Use to attach your curtains to a cafe rod up to 3/4 inch in diameter. 14 per bag. p713-063: 9/16" cafe rod 28"-48" brass finish curtain rods clearance 2-3"
2 1/4" Alexander collection braid, Composition:68 percent rayon, 38 percent cotton. Kirsch wood trend 3 inch diameter fluted wood pole. Wood drapery rods. Extra long curtain rod poles by Kirsch. Note: Some colors are more, unfinished is less than amount below. Antique curtain rods for tab top curtains, eyelet curtains or pinch pleat draperies. 6 foot twisted 1 inch metal curtain rod. Wrought iron curtain rod look. Some colors are more than base price. C rings for curtain rod for 1 inch pole. 1 1/2 inch inside diameter by 2 inch outside diameter. Some colors are more than base price. C rings are designed to allow fabric to pass by special support brackets. Kirsch superfine traverse rods can be used as wall mount or ceiling mount curtain rods. Two Way Draw, includes 46 slides and 3 center supports. Extra long curtain rods. Superfine drapery rods and hardware for any window in your home. See how to install drapery rods in the support section. Sizes over 94 inches will have an oversize freight charge added. Superfine Traverse Rods include drop in brackets, supports and cord tension pulley for installation. Made from heavy gage steel with a baked enamel finish. Exclusive Kirlon on all sliding surfaces. Push in brackets and extension plates are available as an option. Only the finest pulley sets are used. Strong and durable with a slide gate for easy removal of extra slides. Long wearing, stretch resistant polyester cord and continuous lacing for use at either end or to convert to a one way draw. Two way draw, extends from 100 to 180 inches. Extra long tension rods for curtains. Spring pressure, white finish. 2 1/2" wide face by 36-60" long. Select wood curtain rod pole 1 3/8" diameter, 6 feet long. Available in 4,6,8 and 12 foot lengths. Ten colors to select from plus unfinished. Base Price is for unfinished rods. Colors will show price in the cart. Note: 12' rods have to be shipped by truck. Up to 96" wide and 8 feet long. Phifer sheerweave 2701 has a one percent openness factor. At left you can see one of many installations that makes motorization desirable. Any window in your home that is hard to access for window treatment control is a candidate for motorization. Width --select-- 85" 86" 87" 88" 89" 90" 91" 92" 93" 94" 95" 96"